Did you know that a significant source of funding for public art has disappeared in four states — Arkansas, Nebraska, Connecticut and Wyoming? How will this impact public art programs in other states? Does this mean that we need to re-imagine art funding more generally? 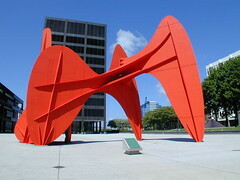 Alexander Calder’s La Grand Vitesse in Grand Rapids, Michigan. Photo by stevendepolo on Flickr. Photo by MeijerGardens on Flickr.. The Percent for Art Program began in the late 1960’s with the Art in Public Places Program (funded by the National Endowment of the Arts) which was essentially an outcrop of the urban renewal programs. Cities and communities began to ‘brand’ their neighborhoods with public art honoring outstanding living sculptors. The program would allocate a percentage of capital expenditure for renovations or new construction on Federal or State-owned projects (usually half a percent of the total construction budget) in order to acquire and install large-scale sculptures. 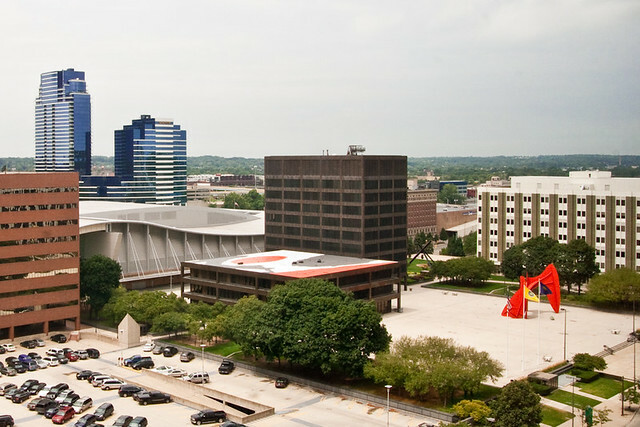 The first of these projects was Alexander Calder’s La Grand Vitesse in Grand Rapids, Michigan. Over the last five decades the Percent for Art has funded murals in schools, installations in airports and traditional sculptural elements in park squares and civic centers. Paul Schock stands next to his sculpture with a panel missing due to vandalism. Photo by Fred Lynch. One could argue that the failure of the Percent for Art Program has its roots in the short-sighted planning funds that mimic funding for other ‘brick and mortar’ projects. Never does the funding account for long-term maintenance or the longevity of installed pieces. Cleaning, conservation, or even major repairs due to vandalism are the responsibility of the host sites. For more affluent cities this would be easy enough to incorporate into various expenditures under general maintenance line items, but for smaller cities that are already struggling with a lean budget, these pieces become eyesores. Instead of brainstorming clever ways to deal with long-term care, maintenance and stewardship or encouraging more time-based and ephemeral art installations, many communities and states are opting to eliminate these funding programs all together. However, there is one a phenomenal example of what a community can do when faced with vandalism and the responsibility of stewardship of a project. Marcus Young, artist-in-residence in St. Paul, Minnesota, created a healing performance around the vandalism of some sandstone sculptures. I learned about his work while attending a panel discussion at the College Art Association’s Annual Conference in New York. Christina Schmid of the College of Visual Arts in St. Paul presented her paper, The Practice of Imagining Communities, which focuses on the work of two Twin City artists, Marcus Young and Christine Baeumler, and their direct engagement and involvement with their communities. 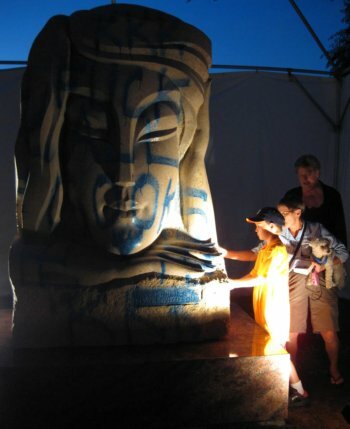 In July 2008, a sandstone sculpture of a woman’s head in Lake Phalen Park in St. Paul was defaced with blue graffiti smears: racial epithets disfigured the sculpture’s serene appearance and cast a shadow over the annual Dragon Boat Festival, scheduled to take place in the park a few days after the vandalism occurred. According to Marcus Young, the typical response of the city to violations of this sort consists of covering up the offending marks, effectively rendering them invisible to those who might be hurt by them, and removing the marks as promptly as possible under the cover of night, as if to pretend that nothing ever happened in the first place and to restore “normalcy” as quickly as possible. But since the sculpture in question had been created as part of Minnesota Rocks, a sculpture symposium dedicated to creating art in the public realm, and owned by Public Art St. Paul (PASP), the city’s default response in maintaining public order was open to slight alteration. Photo from Christina Schmid’s article on Quodlibetica. Like an injured patient, the sculpture was sheltered from public view by a white, gauzy paravent meant to be entered only by those who wished to witness the harm done. 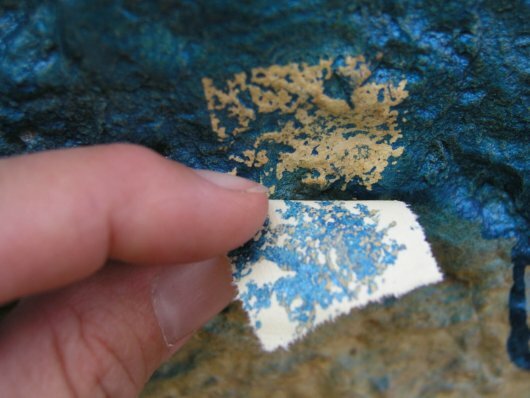 Those who did enter were invited to participate in the restoration: each visitor could apply a one square inch piece of tape which had been prepared by a conservator to the blue scrawls. Peeling off the tape effectively removed the spray paint. Thus the stream of visitors slowly restored the sculpture’s warm sandstone color. This public art as ritual was conceived to give participants a way to recognize and mourn the racist attack, witness the sculpture’s defacement, and to ultimately become part in the restorative power of a communal response. “The piece”—if that is indeed the best way to refer to it—broke with the habit of restoring the public space to its usual appearance and created a communal response that empowered not only those harmed by the epithets but also those who wanted to show their support for those who’d been hurt. Public art allowed for a slowing down, a conscious registering of what had happened—and it was created in immediate response to an issue the community confronted. I was thrilled to see this example. Young’s work embodies the Joseph Beuys’s concept of “social sculpture,” which involves a participatory approach, where viewers share a sequence of consequences and form a new sense of stewardship and renewal. This process involves time and commitment beyond the usual call for the public participation when encountering public art. By re-imagining the Percent for Art Program as a catalyst for more experimentation, rather than a dated system for memorializing and beautifying, the program can evolve – as its public audience has – to support works that engage, rather than stagnate. Addy Smith-Reiman is a dual-degree Masters Candidate in City and Regional Planning and Landscape Architecture at Cornell University with a BA in Art History from Sarah Lawrence College. Her research involves the study of short and long-term maintenance planning for a variety of landscapes such as National Parks, Earthworks and Land Art, rural landscapes, urban streetscapes, gardens and parks. From developing a component of the Shenandoah National Park Cultural Landscape Inventory, to working in Leuven, Belgium, on 3D Heritage Recording in collaboration with the Getty Conservation Institute, she works on public places and shared spaces that are both historically and currently significant.